Using our online ordering system you can buy a name change kit for your client and have it delivered automatically on the date of your choice. You can also include a personal message. If you would like to also give something in hard copy to your client, we have a I've bought you a gift" flyers that can be printed and given in a card, in your information pack, or with the marriage certificate after the wedding. Please contact us after your 10th purchase and we will provide you with a discount code for 50% off all of your future purchases. (This code can also be provided to your clients if you would like to offer them a discount rather than purchasing a kit for them). 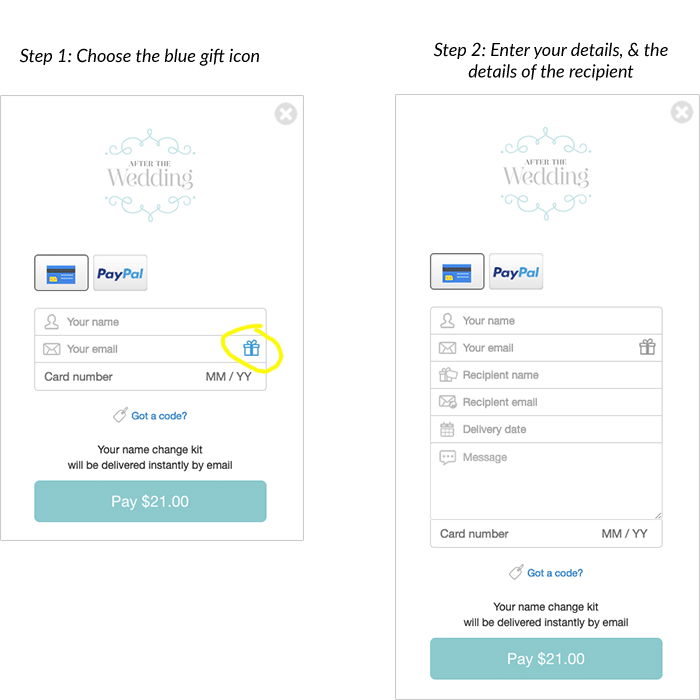 After clicking on the add to cart button below, choose the blue gift icon and enter your client's details.